L'Ortolan at the Kempinski Hotel San Lawrenz on Gozo in the Maltese Islands offers exceptional Mediterranean and Maltese cusine. 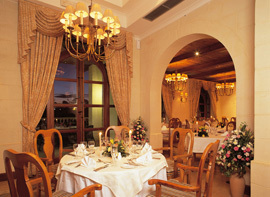 Edward F. Nesta and I spent a perfect Mediterranean summer evening dining at L'Ortolan in June 2007. Jonathan Spiteri, Executive Sous Chef began our L'Ortolan dining experience with a tempting Amuse Bouche of a delightful cold kiwi soup served in a demitasse cup. Laced with apple juice, cinnamon, and milk, and garnished with fresh mint from the hotel's organic herb and vegetable garden, it was a lovely introduction to his culinary style. Accompanied by delicious warm rolls served with tomato butter made with tomatoes grown in their garden, it was a perfect beginning to the evening. Dining outside under a crescent moon, with a single star directly above Edward's head, I made a wish on the first star of the evening. A light breeze gently caressed the potted plants and the palm trees that decorated the terrace, and the night was so quiet that we could hear nature's sounds of summer in the air. We sat on black wrought iron chairs with comfortable beige cushions at a marble table set with woven placemats, and decorated with a terra cotta pot of rosemary, and a black lantern casting a warm glow around us. Our table overlooked the swimming pool illuminated with twinkling lights, adding to the overall ambience of the restaurant. Although the restaurant inside is lovely, it was a night to sit outside and celebrate the beauty of a Mediterranean summer evening. 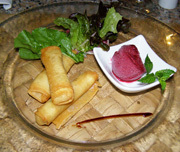 For a first course, Edward selected Smoked Cheese and Shallot Spring Rolls accompanied with Salad Leaves and Sorbet de Cassis. Chef Jonathan likes to incorporate Asian elements into his fusion cuisine, and this dish perfectly fused Asian and Maltese elements with three crispy spring rolls filled with wonderful Gozian smoked cheese. Together with the refreshing homemade cassis sorbet, this course was a definite highlight. 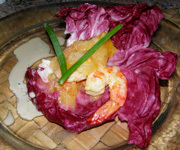 I began with Mediterranean Prawns tossed with Citrus Salad laced with Honey and Lavender Cream, which were presented on a large radicchio leaf. This course was lovely as it incorporated two traditional Maltese elements, honey and lavender, into a fresh and light starter. Edward continued with Rack of Lamb Wrapped in Flaky Filo Pastry Flavored with Indian Spices and accompanied with Lemon Rice laced with Curry Masala. 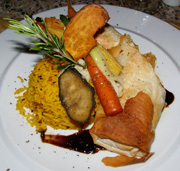 For this course, Chef Jonathan wrapped the rack of lamb in filo pastry and presented the dish with the pastry cut on the diagonal to reveal the lamb inside, accompanied by the rice, baby corn grown in their garden, and carrots. For my second course, I selected the Sea Bass Cake stuffed with Sultanas and Pinenuts, on a Potato Tower, drizzled with Lemon Cream. 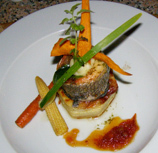 This course was attractively presented with a sea bass filet wrapped around a sweet and savory stuffing of sultanas and pinenuts, on a round bed of layered scalloped potatoes accompanied with baby corn and carrots. A dollop of potato puree helped secure carrot slices and an oregano spear garnishes. We finished the evening with a tasty selection of desserts, which included a Walnut Torte topped with Chilled Spice Ice Cream and a Candied Orange "hat" resting on a chocolate biscuit balanced on two walnut breads for Edward; and for me, Pistachio Cake served with Chocolate Cake, Poached Pear in Red Wine, and Forest Fruit Ice Cream. Although the pastries were excellent, the homemade ice creams were definite standouts with their interesting flavors, and were perfect on a warm summer evening. We returned to L'Ortolan for our last evening on Gozo for the restaurant's Barbecue Evening where the chefs manned large outdoor grills tempting the diners with grilled to order swordfish, tuna, chicken, steaks, and more, accompanied with fresh corn on the cob, jacket potatoes, ratatouille, salads, smoked tomato soup, and a large selection of gorgeous desserts including Tiramisu Smoothies. All in all, it was a memorable evening. Read Chefs' Recipes where Executive Sous Chef Jonathan Spiteri shares his vision and some tantalizing recipes in English and Maltese. For information on the Maltese Islands, please visit: Malta Tourist Authority at www.VisitMalta.com, and Heritage Malta, www.HeritageMalta.org.